Are you looking for something rewarding and different? At CDO we appreciate any time you can offer. There are many things you could do, as a fluent English speaking teacher, playing sports and games with the children, helping CDO with administration, helping keep the website updated, and ongoing projects or just having a lot of fun here at CDO with our charming children. We need your help in all of these areas. Whether you have experience or not, you can teach English, Maths or any relevant subject you like, so long as it’s in English. 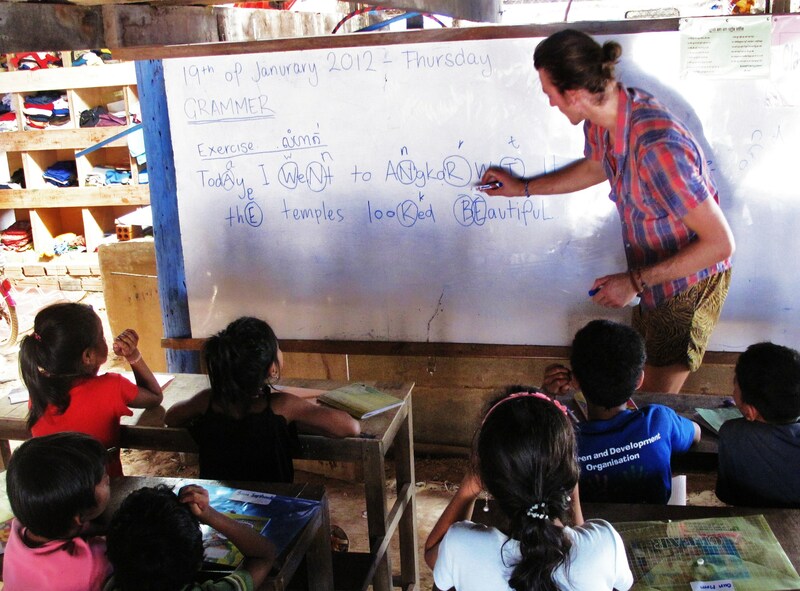 It’s not hard once you get going and it’s a great way of contributing your time in Cambodia. Most of the children already have good English skills and can communicate fairly easily. There is a range of ages and levels however (5 to 20 years old), so we need more volunteers so we can separate the children and attend to their varying abilities: there are 3 classrooms. What we can guarantee though, is that they are very eager to learn and will soak up as much knowledge as you can give them. English isn’t the only subject you can teach, Maths and very basic science would be fantastic or any other subject you think would be beneficial to their education. We do encourage our volunteers to get out of their comfort zone and try something different. We are using a teaching guide that provides guidelines on lessons to ensure continuity as volunteers come and go. As a teacher, if you can spend a minimum of one week (or more) at our children’s home in Siem Reap, we’ll be glad to have you and your time will be greatly appreciated. As all of our volunteers tell us when they’re here, you’ll enjoy every moment and it will be more than worth your time here. CDO kids are no different to kids elsewhere in the world. Our children love sport. Volleyball is the most popular sport played in Cambodia and all the boys love playing soccer. If you can teach the kids new games, go for it! 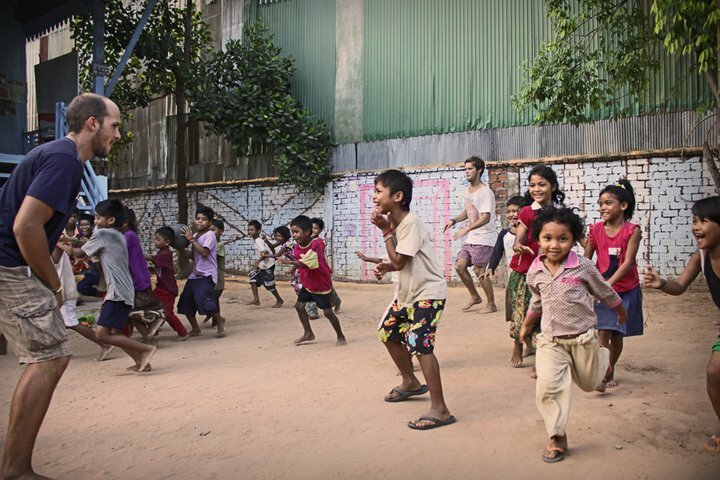 They love play time and enjoy it even more when volunteers join in. It’s a great way to spend the afternoon whether it be playing tag, soccer or throwing water bombs at each other! We’re certain you will have the time of your life getting involved or just watching the kids have a good time. Assistance is always needed and appreciated with the administration side of things. You probably do have skills to offer that will greatly benefit CDO. We also are always looking to improve what we do here at CDO, and if you think you have knowledge or ideas that we may find useful for any aspect of CDO, the projects or running of the organization as a whole, we’re always happy to listen to what you think and greatly appreciate anything you can help with. Advice on education, building and agriculture are what would help the most. We have at this moment a garden where we plant some vegetables and the children are taught to take care of it. We also have other programs like a nutrition and health follow up (body measurements, lice treatment, dentist and medical check-ups). You don’t have to be a professional web developer to be a big help in this area! If you have basic knowledge of WordPress and Facebook then chances are that you are able to help us keep our social media updated with useful information and just keeping it looking fresh! Uploading photos, posting short news posts and showing the other current volunteers how to make posts is a huge help! 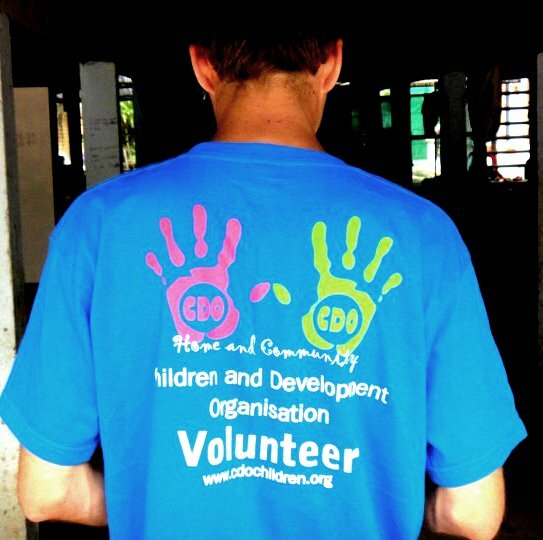 What do you need to come and volunteer at CDO? Apart from that, all you need is a love of children and a desire to help in any way possible. If you can, we ask that you fill in the form (click here to download) and email it to us before you arrive at CDO. Please print out your completed form at home/hostel/public printer before your arrival and bring along all supporting documents needed (e.g. copy of passport, visa, photo). This will save time, so that you will not have to fill it out while you are there. You can email to info.cdocambodia@gmail.com or see ‘Contact Us‘. Unable to volunteer? Why not send us a donation online? Money is always needed at CDO for food and clothing for the children, as well as providing assistance for our building project. Every little bit helps us. My name is Holly Laws and I am a physiotherapist in England UK. I am afraid I can only donate 2 days (Thursday and Friday this week) as Ifly to Laos the day after. If I can be any help either playing sport or anything else then please let me know and I cna come by and help. Me & my sister, Angie Kung will be at Siem Reap on 26 Nov and would like to visit your orphanage home on 28 Nov. We are able to teach balloon sculptures and also like to bring some exercise books & pencils etc for the children. Besides above-mentioned, what other things you may need us to help in. I look forward for your reply soon. My name is Kristel. I am 23 years old and grew up in the Netherlands together with my 4 younger siblings. I finished bachelor and master in Business the last years in both the USA and the UK. From the 19th of November I have the possibility to volunteer for 2 weeks. I could play with the children, teach them, or provide help with other activities. My partner and me would like to do some volunteer with you. We could play with them and even try to teach them English. We come from France. We really would like to do this experience with children to help you. We are able to come in April for at least one week. Could you please let me know your availabilities and contact me on my email address ? I am sorry for the late reply! If you ever come back to Siem Reap please visit us, we would appreciate your help! The door is always opened. Hi my name is Elin and I’m 26 from the U.K. I am traveling with my best friend Samantha who I worked with in a bar in Melbourne for the past two years. I have a degree in religion and I have worked as a support worker for five years in Wales for people with special needs. Sam is studying health science in university in Melbourne and is a part time bar manager. We are currently in Cambodia and would love to give up some of our time in order to help/ teach in your orphanage in Siem reap. We are available to begin from tues 22nd of April until 29th April . Please let us know ASAP of the details etc. We look forward to hearing from you.